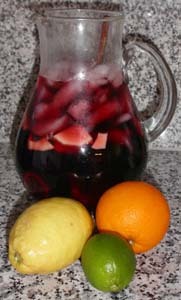 Sangria is a typical Spanish drink during the summer, which we can enjoy a hot summer night. Rinse of and wash the orange and lemon carefully and cut them into thin slices. Peel the apple and remove the pips. Cut it into thin slices. Mix the fruits with the sugar, the cinnamon and cloves in a large pitcher. Add the red vine and the brandy and stir until the sugar dissolves. Leave the pitcher in the fridge for at least one hour. At the time of the serving the soda and ice are added. Stir and serve in chilled glasses. Non-alcoholic sangria: Skip the brandy and replace the red wine with non-alcoholic wine.